Canopy by Hilton is a new Hilton brand aimed at innovative ways to make hotel life more enjoyable. 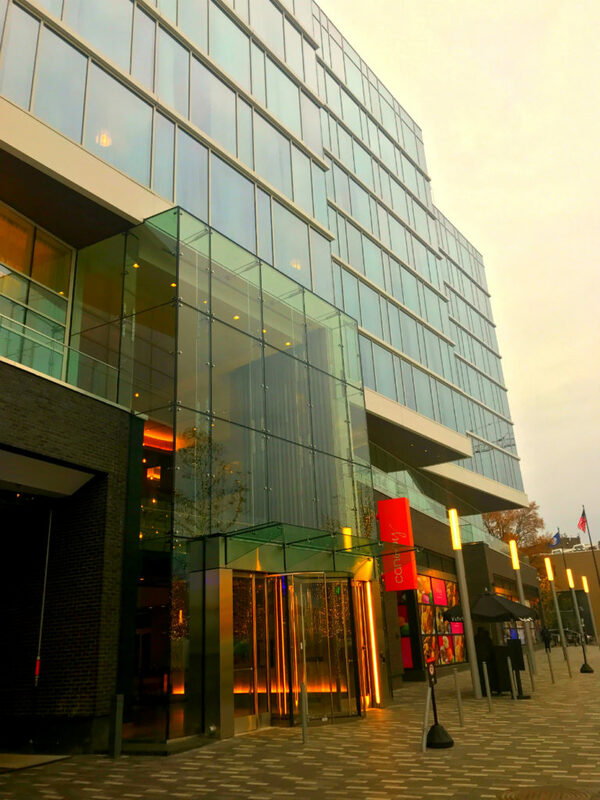 The newest Canopy hotel in Southwest Washington DC is part of the hot new waterfront development called The Wharf. 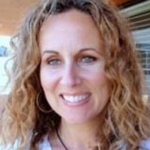 TravelingMom Kim Orlando says it’s a hip and trendy hotel for a hip and trendy spot. The Canopy by Hilton brand debuted in Reykjavik, Iceland. 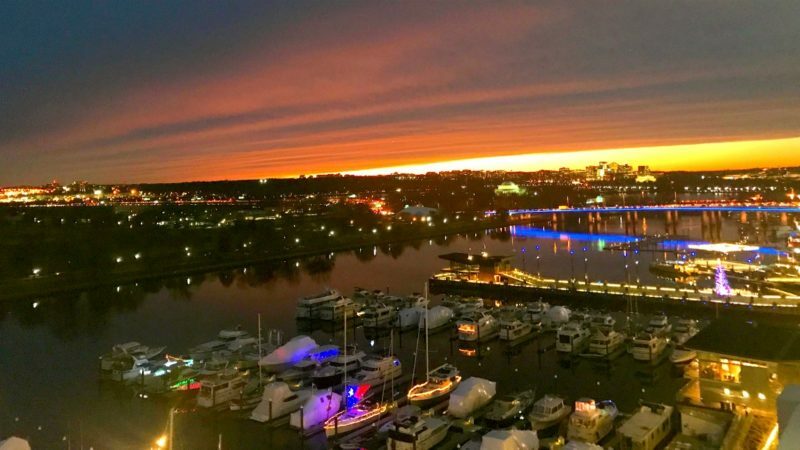 The location at The Wharf in Washington, DC opened in October 2017. It is the realization of Hilton’s focus on innovative ways to make hotel life more enjoyable, based on research from the company’s innovation lab at its DEC headquarters. The lab is looking for ways to make hotels quieter, ensure guest sleep better, have access to fresh air and easy-to-use technology. Judging from my visit, the company succeeded. 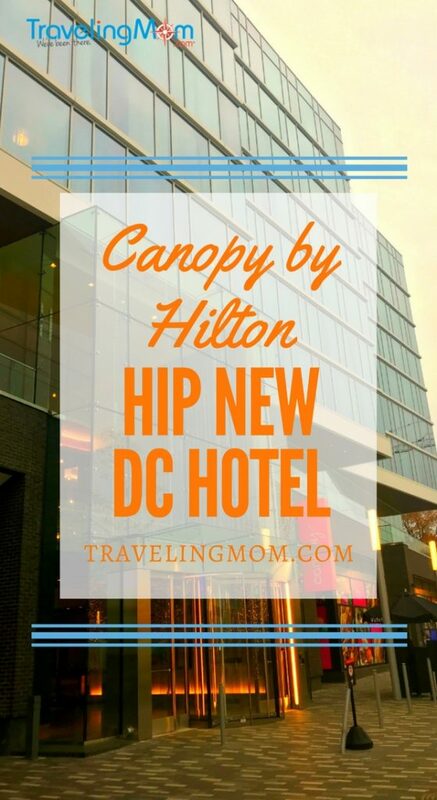 My suite at Canopy by Hilton in Southwest DC was quiet and comfortable, there was enough room for a family, and I found plenty of fun things to do in Southwest Waterfront DC. As an added bonus, it was easy to get to the National Mall by Metro or via the free shuttle. That’s right. Free. 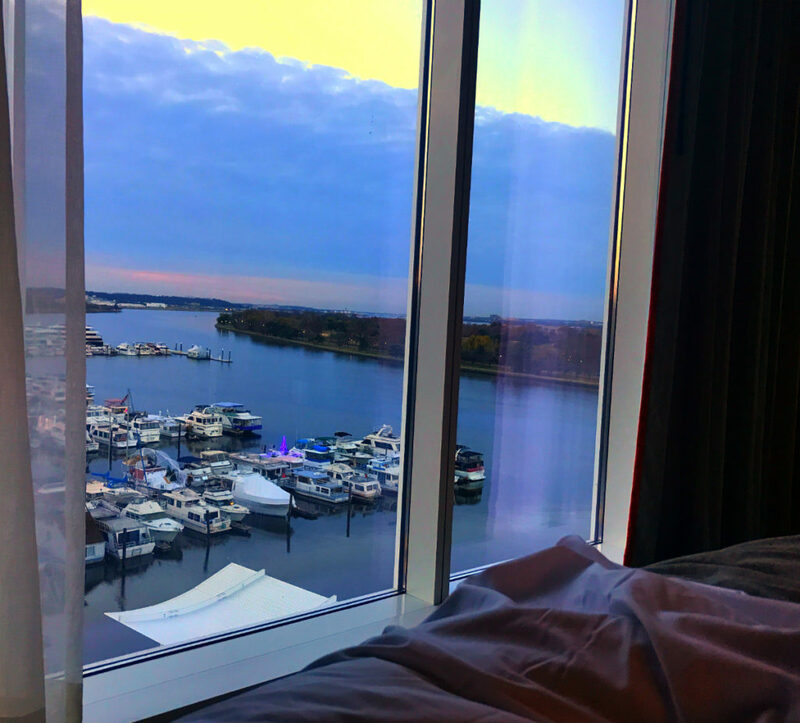 When I arrived, I offered my Hilton Honors rewards number and because of my gold status, I was upgraded to a waterfront view suite. This was a truly great benefit, an upgrade where you could see the difference. My room had floor to ceiling glass, to take advantage of that view. The “barn door,” one of the innovative Canopy hotel features, separated my bedroom from the dining area. The door, available in every type of room, helps reduce hallway noise. I also really liked the decor. Dedicated to local flavor, my room had a map of the DC area as wallpaper behind the huge flat screen television. It’s ecological, too. There are no plastic water bottles at a Canopy by Hilton hotel. Instead, my room had a keepsake bottle that I filled at the filtered water station down the hall. I visited a standard room, which was not as large as my suite but it had the same decor and plenty of space. There are cribs available for families with young kids and if you have a large family, you can reserve adjacent rooms. 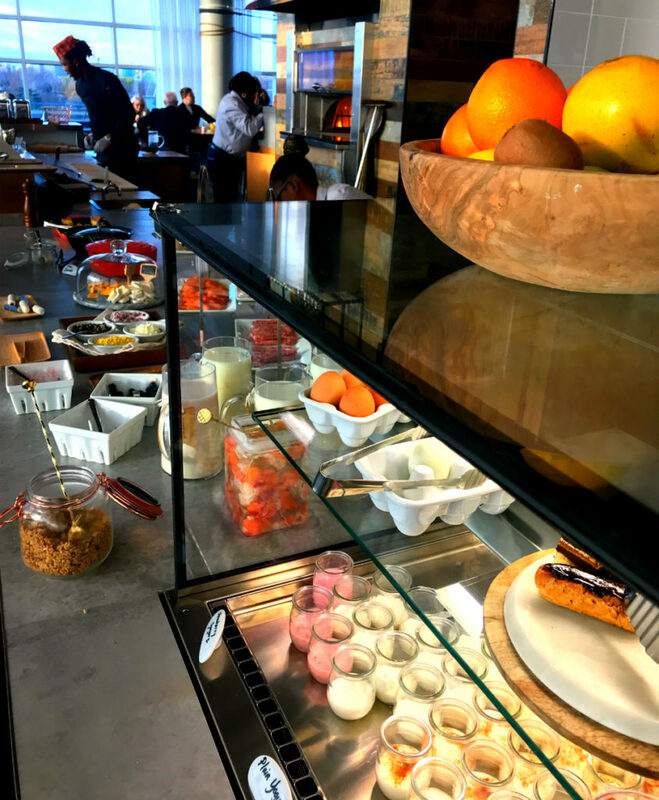 Canopy offers an Instagrammable (free) breakfast. Delicious, local and fresh. The wood burning oven turns out flatbread egg pizzas for breakfast, displayed artfully on cutting boards. There is fruit-infused water, yogurt and coffee from a local roaster. If you are in a hurry or prefer to eat in your room, you can get a bag filled with fruit, yogurt, and coffee delivered instead of going to the artisenal buffet. Every room has a breakfast area, with an Nespresso machine so you can make your own perfecto cafe. Since the Canopy abuts a glorious stretch of waterfront biking paths, the free bicycles are an important amenity. The Canopy has a dozen bikes available on a first come, first served basis. A helmet and a lock is included. Or if you prefer, the large gym (shared with the adjacent Hyatt House) has all the latest equipment. Hilton Canopy has free Wi-Fi. And, since it’s an unstuffy but comfortably luxurious hotel, suites come with bathrobes and comfy socks. The barn door also separates the bathroom from the sleeping area. 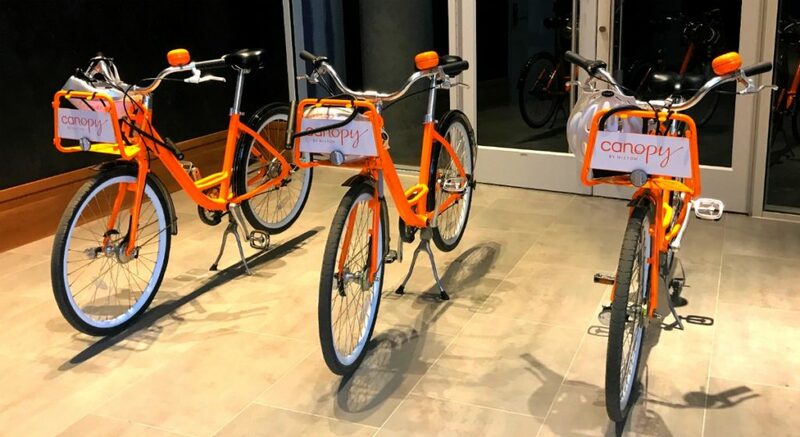 And it gives your spouse or partner a private place to dress if he wants to slip out and go for an early morning run or bike ride along the waterfront path. Double sinks and a large glass enclosed shower had plenty of space. Dogs get their own goodie bags, with locally made dog treats, along with a bed, leash and food bowl. Dog parents get a map of local dog friendly establishments. My only complaint is the “uncloset.” That’s an open area with no door where you store your clothes. I am around 5’5 and the hem of my dress hung past the bottom of the “uncloset.” If I’d had young kids with me, there would not have been enough room for all the clothes. I predict they would be strewn all over the room. However, it was hard to totally dislike the uncloset because the hangars were so darn cute. They were engraved with sayings like “just hanging out.” Had to smile at that! Also, the desk faced the wall. I don’t want to look at a wall or at myself in a mirror all day. With such stunning views, the desk should have been oriented towards the windows. Canopy highlights its neighborhood, with artwork that reflects local attractions. When you check in, you get a welcome gift from a local purveyor. At the DC Canopy, I was given a tasty chocolate from a DC chocolatier. And if you bring a dog, you get a doggie goodie bag and a map highlighting dog friendly businesses nearby. 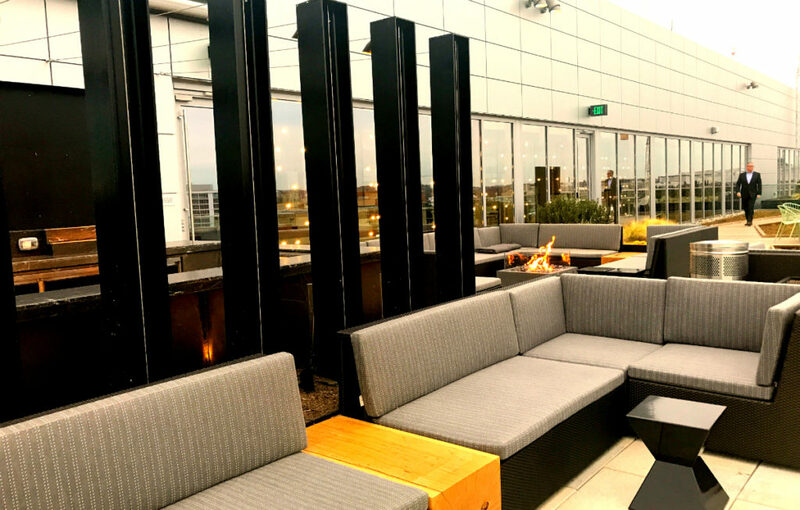 Whiskey Charlie, Canopy’s rooftop bar, is worth a visit, even if just for the view. The bar and the outdoor patio overlook the old and the new- the old boat that is being renovated into a restaurant, and the new walking paths and parks that are still under construction. Every evening, there is a free tasting, featuring local craft brew and local distilleries. My older son is legal now, so we can enjoy this together. Mike Anderson, the “Chief Enthusiast” at Canopy, said he changes the tastings daily, and has even brought in a local syrup company that he uses in craft cocktails. I’ve been wondering where to stay when I go to DC specifically for the African American cultural heritage museum. Now I know. Thanks for teaching me about the Canopy.